Article: Konversi dan loncat pagar at ‘Art Patio’ An exhibition showing the work of UNDIKSHA’s 2016 art faculty graduates Students of the art education faculty of Universitas Pendidikan Ganesha (UNDIKSHA) in Singaraja presented their graduation work(s) in an exhibition at the Art Patio in Kaliasem, Lovina which lasted the whole month of September. The Exhibition featured fine art and design works in a wide range of media. 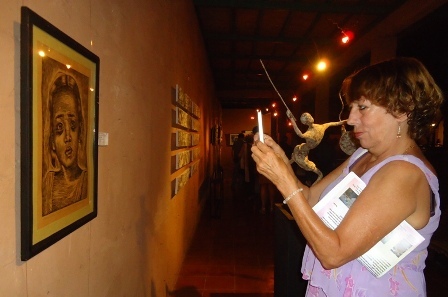 The official opening of the exhibition took place on the third of September and attracted a large crowd of art students and their friends as well as guests from the area. The initiative and invitation for the exhibition came from Art Patio, with the art faculty curating the show and selecting the best works from each participating student. The exhibition is the culmination of the fine art program including paintings, graphic arts, wood, metal, visual communication design, textile, photography and ceramics. A total of thirty students were chosen to join in the event and this included some undergraduate students chosen for their very promising talents and skills. The names of all participating students were; Gede Nangga Bayu Suwita, Abdullah, Muhammad Fikri, Alfan Hisbullah Dede Agi Bahrial, Dede Irawan, Amalia Ika Safitri, Yogi Pramana, Putra Wirawan, Irma Dwi Noviani, Gede Wijana, Putu Yuda Adnyana, Gilang Gelantara, Gede Donny Purbayana Wismaya, I Komang Wikrama, Mirza Prastyo, Kadek Edy Satriawan, I Nyoman Putra Purbawa, Dedy Nur Saputra, I Putu Acitya Gotama, Dewa Agung Mandala Utama, Muhammad Erwin, Saupi, Zahrwani, I Ketut Santika, kadek Putra Yasa, Ni Putu Wikan Tariasih, Agus Salim, Babat Nufus, Pande Putu Darmayana, Dewa made Johana, Salma Putu Nur Rohma, Mzade Wijana and I Made Dwipayana. The choice of art objects was indeed diverse and gave a good impression of the talent and developing skills this new generation of artists is going to bring. Two young artists whose work stood out were happy to pose in front of their works and explain what their inspirations and dreams are. Dewa Agung Mandala Utama posed in front of the impressive metal statue called “Searching for selfish” and explained it took him a month to create the piece. He gained inspiration from artists in Bandung, West Java, and he feels he will continue to learn and develop as an artist in the future. Another young artist, more representing the traditions of Bali, I Ketut Santika posed in front of his painting called ‘Realita Bali’ and explained that, yes, the Balinese painters, especially from the Sanur area his inspiration and that he hopes to be able to continue studying and developing his skills and be an independent painter by profession. His next challenge would be to start working in color and he hopes he can continue his studies for some time since there is still so much to learn. Drs, Hadirman, head of the art faculty of the Undiksha wrote in an introduction to the exhibition; this exhibition reflects the stages in the learning process of our art education (faculty). Some students are working on ideas of aesthetics while others work on creations representing an ideology. The students try to leave boundaries behind, those conventions holding them back, and we could also call this challenge ‘a jump over the gate’, hence the name of the exhibition , “Convention or Jumping the Gate” According to Hadirman; In contemporary art today we recognize two trends the conventional and non-conventional but the creation is in the end the same. Both deserve a life on their own. What we have on show at this exhibition is not these two approaches opposing each other, but rather the two approaches reaching the same creative goal. It is the second time the Art Patio in Lovina has been the host for the UNDIKSHA graduating art students. The Art Patio has become a well-known gallery for quality contemporary art exhibits in the area since its inception four years ago. It is a place where contemporary visual and performing arts developments in North Bali are actively stimulated. Apart from facilitating individual or collective art activities, ‘Art Patio’ would like to promote the arts through art classes. The gallery has a steady group of followers and the exhibition area is booked long ahead by artist groups or for solo exhibitions. Some of the artists are self-made, while others have had formal art education like these young art students from UNDIKSHA. They are making their first steps in the art world with this exhibition.